In 1963, LaCrosse® introduced the Burly—an insulated, do-it-all Rubber Boot that customers knew they could always trust. Today, these Boots are alive and well. They’re still made from proven ZXT rubber that's naturally scent-free, durable, and resistant to cracking. They're still built to perform under the harshest conditions. And they're still the Boots you can call on to get the job done. Each approx. 18" h., 43 ozs. Weight per boot (approx. ): 43 oz. 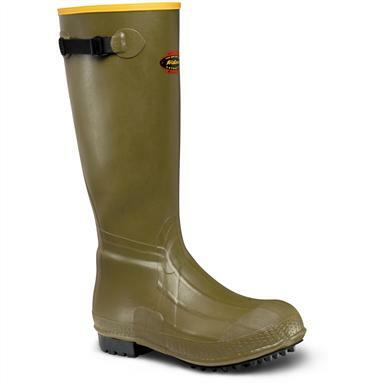 LaCrosse Mens Burly 18 Air Grip Foam Insulated Rubber Hunting Boots is rated 5.0 out of 5 by 6. Rated 5 out of 5 by Divine Rapids from All Season Boot With 18" height you can get through some swampy ground, the air grips are good in snow and slippery hillsides are negotiable as well. The boots keep you warm way below freezing and are comfortable all day. Fit to size as normal for me. All good! Rated 5 out of 5 by Fishcop 126 from Excellent and tough boot!!!!!!! I purchased these boots for a moose hunting trip to Newfoundland this fall and am so pleased that I did!!! These boots fit perfectly, even with heavy wool socks, and performed perfectly. After long days of trudging through swamps, forests and the hated "spruce tuck" these boots were warm, dry and comfortable. I am very satisfied with the performance and versatility of this product, and highly recommend them to all. Rated 5 out of 5 by Yotehowler2 from Great Boot. Can't go better than Lacrosse As always great fit and boot. I purchased three pair for the whole family. We use them every day for chores. Rated 5 out of 5 by mkf1 from as always, Lacrosse boots are the best! great boots, decent price. Rated 5 out of 5 by TRAVIS/DEBRA from Cheapest place we could find these boots. Good quality. Boots arrived 1 week before they were supposed to! Very happy!